Father’s Day is coming up and what better way to celebrate it than to learn some of the names of some of the fathers that are in the Bible. This Bingo game is simple to do and could be an activity in during a lesson or it could be the lesson itself. As you call out each name you can have someone tell a little about that father: who were their children, what important thing(s) did they do for God, did they make any mistakes, etc. 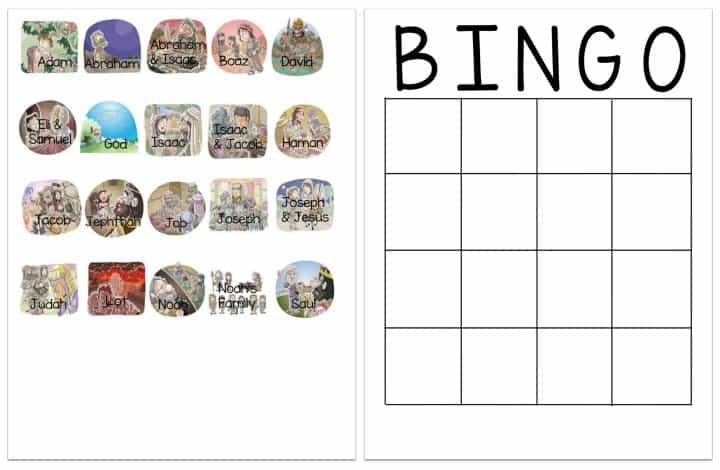 Simply print out the blank Bingo game board and father cards for each child in your class. They can cut out the father cards and glue them to their own board making each board unique. Print out another copy of the father cards for yourself, cut them out, put them in a hat or bowl, and play Bingo. Don’t miss our Father’s Day coloring pages and Sunday School lesson for Father’s Day. Included in this BINGO game: Adam, Abraham, Isaac, Boaz, David, Eli & Samuel, God, Isaac, Jacob, Haman, Jepthan, Job, NT Joseph, Judah, Lot, Joah, Saul. Tony Kummer (Editor) reviewed & updated this page on : May 20, 2016 at 10:34 am. All our content is peer reviewed by our readers, simply leave a comment on any post suggest an update.